Bali, the island of the Gods is a rare paradise for scuba diving enthusiasts looking for something different. Bali is a dream place for all the senses: bright greens of the rice terraces, the vibrant music of the gamelan – a traditional xylophone, the sweet fragrance of the frangipani flower, the mouth-watering babi guling – suckling pig, or the deep relaxation a Balinese oil massage. Everything is an invitation to take the road and discover each corner of it while exploring some the finest scuba diving sites in the world. This Indonesian island gathers everything an adventure diver could dream of: colourful coral reefs, encounters with huge fish, cave diving, using traditional Balinese boat, muck diving or even technical diving. Want know where to dive in Bali? Here's our ULTIMATE in-depth guide. Amed is a quiet fisherman village on the black sand coast of the east of Bali. It is the perfect destination for scuba divers looking for an authentic Balinese experience while enjoying a relaxing atmosphere along the sea. Whether you go wall or muck diving, the charm of diving in Amed is the transfer part from the beach to the dive site: with a traditional jukung boat. This traditional fishermen boat is common in Indonesia and the Philippines, but the origin is Balinese. It is a small wooden sailboat that looks like a canoe with two outriggers and a triangular sail (which is now also equipped with a gasoline engine). To reach most dive sites, a boat trip of 10 to 15 minutes is necessary. Starting your scuba diving day with the sensation of surfing right at the surface of the water while embracing the traditions of the local fishermen is an unforgettable and unique experience. If you never heard about muck diving before, don’t feel repulsed by its name. The experienced divers know very well that behind the “muck”, generally a silty seabed of black volcanic sand, you can find the most incredible tiny treasures of the local ecosystem. It is the perfect environment for many species to grow in their early stages of development, so muck diving sites are like the sea nurseries. As pipefish, nudibranchs or seahorses require patience, knowledge and good eyes to be spotted, if you can go with a Balinese Divemaster, you’ll be sure not to miss anything. The surroundings of Amed are very famous for this activity and loved by underwater photographers. Among the numerous dive sites, one is very famous for its healthy and rich fauna: Seraya Secrets. If you have time, it is highly recommended to take a night dive there to discover even more amazing species who get active only in the dark. To dive Seraya Secrets, ask the local dive centres of Amed to take you there. Only 30 minutes driving north of Amed, you can find the small village of Tulamben. 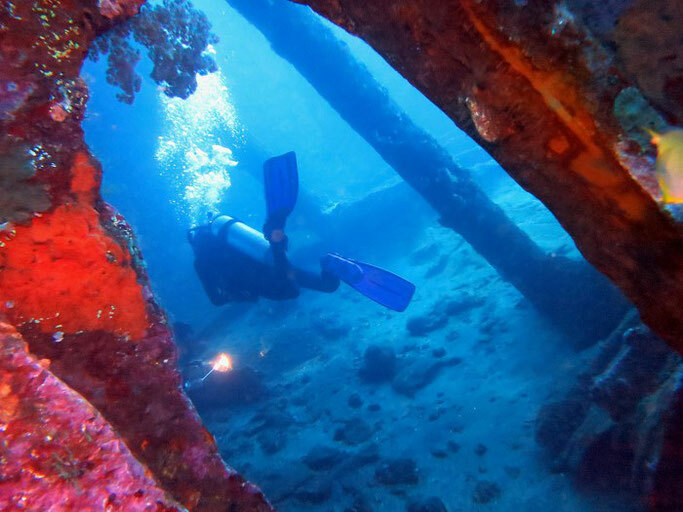 The USAT Liberty wreck is one of the most famous wreck diving sites in the world. However, it is one of the most accessible ones too. The wreck is only 25m from the beach, so it is a shore dive. The highest point of the wreck is only at 5m deep when the deepest point is at 30m beneath the surface. As a result, it is an excellent dive site for all levels of scuba divers. The American ship was torpedoed between Bali and Lombok, by a Japanese submarine in 1942 during WWII. The wreck was then towed to the beach of Tulamben for salvage operations. However, the history does not stop here. In 1963, Agung mount, still an active volcano, erupted, devastating mainly the east coast of Bali. The lava flow pushed the wreck underwater just offshore. From then, it became one of the most dramatic coral reefs for the greatest pleasure of scuba divers from all over the world. It is the home of schools of bump head parrot fish and jackfish that are often spotted swirling above the wreck. For this incredible show, you will have to be the first one in the water at the sunrise at 6.00am. This is why it is highly recommended to spend the night in one of the local resorts of Tulamben. Which scuba diver does not dream of spending time underwater with these gracious giants? With an average length of 3m to 5m from tip to tip, meeting a manta ray is not a scary experience but a breathtaking one. The best chance to observe them for the time of a dive is to go to a cleaning station where they come to get their skin cleaned by tiny lipp fish. This is what Manta Point is at the south tip of Nusa Penida. There, 5 to 6 manta ray can join in an elegant and powerful ballet. Even if this dive is quite shallow, with 10 to 12m deep on average, because of the currents in the area, it is recommended only for scuba divers with experience of currents. Sometimes, the boat captain can call the dive if he thinks the currents are too strong. If you are lucky enough to get there and spend an hour with these fabulous creatures, please be advised not to touch them, and approach them not too fast, very gently. They are afraid of scuba divers’ bubbles, hence, relax and breathe slowly. Meeting the mola-mola, the Indonesian giant sunfish, is like the Holy Grail for many scuba divers coming to Bali. They can be larger than 3m and weigh more than 1000kg! Their round and flat body with two long vertical caudal fins make it very easy to recognise. Unfortunately, even during the high season going from July to September, you will need to cross your fingers very hard to see it. This fish is timid. The best point to hopefully meet one is the sunfish cleaning station of Crystal Bay, located near Penida village, on the northeast coast of Nusa Penida, in the Ceningan Channel. This is recommended for experienced deep divers as the observation spot is between 18m and 30m deep. Be also aware that water can be much colder there, so wearing a 5mm full suit is a wise choice. Contrary to the urban legend created on the Internet, this is not an archaeological dive site but an environmental conservation program. This site, created by local dive centres of Pemuteran, features a 4m high traditional Balinese temple gateway and statues of Buddha, Krishna and Ganesh. The site is now covered in gorgonian, so this project is a success from an ecosystem point of view. It still gives the visitor the feeling of diving on an ancient monument. The interesting part is at 30m deep, but the site has been recently extended with a section at 15m deep to welcome also beginner divers as well. This dive site near Crystal Bay in Nusa Penida is very unusual: combining the thrill of underwater cavern diving with the exploration of a cave only accessible by the sea is extraordinary. You need to dive to 30 m deep to find the entrance to the tunnel leading to the cave. You might meet on the way white and black tip sharks, just to add some emotions to an already exciting dive. While you progress in the tunnel, you’ll see less and less light until you finally see the light coming from the cave. Already in the water, you will start hearing a high-pitched noise. When you surface in the cave, you discover hundreds of bats flying above your head! The lava flow that pushed the Liberty wreck into the sea in 1963 after Mount Agung eruption created at the same time a breathtakingly deep wall descending to 70m deep. Starting at only 3m beneath the surface, it can be visited by all levels of divers. Thanks to its depth, it is a highly appreciated dive site for the divers eager to learn technical skills such as trimix deep diving, to reach depths below 40m. The site is famous for being covered in gorgonian, sponge and black coral. Contrary to the USAT Liberty wreck, you will have more chance to meet white tip sharks on the wall. The sea fans hanging on the wall are also great to look for pigmy seahorses. If, after all these scuba diving adventures, you need something to rest, but you are looking at still spending a bit more time underwater, why not joining one of the free diving schools of Bali? It is an excellent way to expand your underwater skills, and the interesting point is that the free diving schools associate yoga practice. The deep relaxation and breathing exercises of yoga help the divers to work on the control of their body while holding their breath underwater. 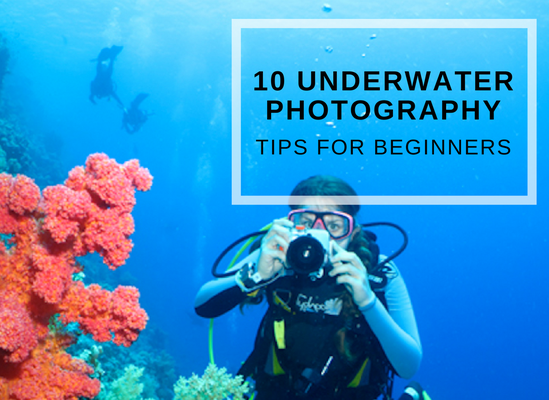 The freedom of diving with gear is now gathering more and more enthusiasts. One of the best places to find these freediving schools is Nusa Lembongan. The quietness of this small paradise island is an ideal setting for free diving and yoga. We love diving in Bali, but there are so many providers to choose from so who do you go with? First check PADI Travel's list of scuba dive centres in Bali to see if there are any good deals on, and also take a look at liveaboard options where you will get to see even more of Indonesia diving. 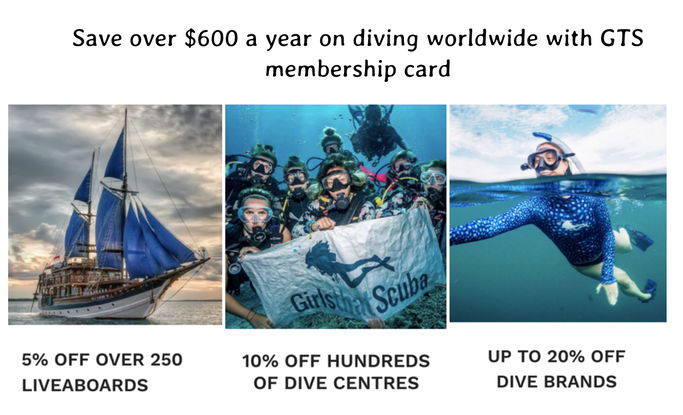 You can also get 10% off diving with selected operators in Bali if you have our GTS discount card - alongside hundreds of other discounts on diving and brands worldwide! Bali is almost unbeatable at offering such a vast range of scuba diving adventures. With its inspiring landscapes and culture, it is hard not to fall in love with the island. To enjoy scuba diving in Bali, it is recommended to be already an advanced open water diver qualified for deep diving. Experience with drift diving and currents is also recommended. Scuba diving in Indonesia is fantastic but can sometimes be challenging. The best season to visit Bali would be from July to September to get a chance to spot a mola-mola, but, unfortunately, it is also the high season. If you want to experience the island away from the crowds, even January, in the middle of the monsoon season, is not so bad. It is raining mostly at night and maybe 1 hour of the day, but it is still warm and comfortable. Prices for stylish and comfortable accommodation can drop to 10$ at that time. Except if you want to see the mola-mola, Bali can be dived all year long, with a preference for April to November, the dry season. 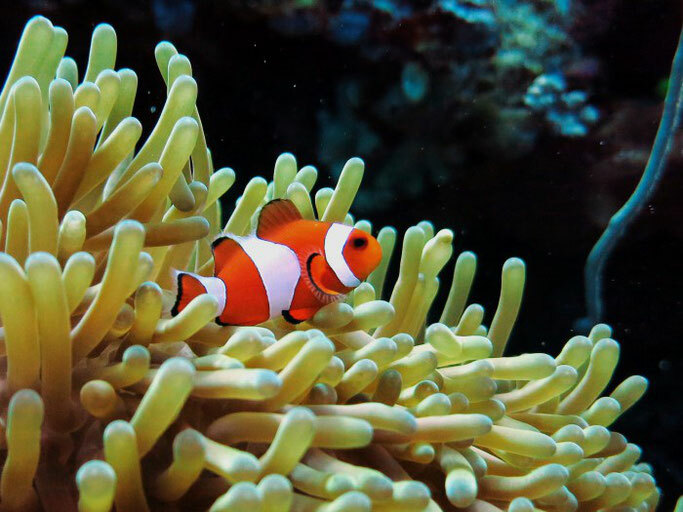 Find here an itinerary allowing to dive the best sites in Bali in only 2 weeks. Florine is a passionate Divemaster and avid traveller. World Adventure Divers- her dive travel blog - will help you discover the world underwater & beyond! She is currently scuba diving all over Europe and travel to more exotic locations all over the world once in a while.